One of the great scandals of today's global village is the deaths of hundreds of thousands of mothers each year simply because they are carrying or giving birth to a child. The last reliable estimate, from 2008, indicated nearly 343,000 of these maternal deaths. The scandal lies in the fact that most of them are easily preventible with basic health care, as the West discovered more than a century ago. Abortion, however, must be safe for the woman -- that is, provided by medically qualified people or by medically certified means -- and to be safe it must be legal. Where it is illegal it will happen anyway but it will be unsafe, and often lethal. States which persist in keeping abortion illegal or severely restricted (and not the agents who are pushing this form of birth control) are thus contributing to the dire maternal mortality statistics. And states which ban abortion after it has been legal are similarly putting women's lives at risk. That, as they say, is the narrative. There's just one problem with the drift of this story: there is no proof that it is true. The only hard evidence that we have on the subject of restrictive abortion laws and maternal mortality rates (MMR) is very new and it points in the opposite direction. Research from Chile published a few days ago shows that, when therapeutic abortion was banned in 1989 after a long period when it had been legal in that country, there was no increase in maternal mortality. None at all. On the contrary, maternal deaths continued to decline. Chile today has one of the lowest maternal mortality rates in the world (16 per 100,000 live births), outstripping the United States (18) and, within the Americas, second only to Canada (9). Rather than the rogue violator of women's reproductive health that the UN makes it out to be, Chile is looking this week like a model for countries that really want to save the lives of mothers. Figure 1. Trend for maternal mortality ratio, Chile 19572007. The study, published in the open access online journal PLoS One, is the work of Chilean and American researchers led by Dr Elard Koch, epidemiologist and a professor at the University of Chile and Universidad Católica de la Santísima Concepción (UCSC). The group, who formed the Chilean Maternal Mortality Research Initiative (CMMRI) for the purpose of the study, had access to exceptionally good data: 50 years of official records from Chile's National Institute of Statistics, 1957 to 2007. These provide the basis of what the authors call a "natural experiment" in fertility and abortion policy. Delivery by skilled birth attendants. For each 1 per cent increase in the number of deliveries performed by skilled attendants there was an estimated decrease of 4.58 maternal deaths per 100,000 live births. Clean water and other sanitary improvements also played a part. Access to maternal healthcare services. Nutrition programmes for mother and child, coupled with the distribution of fortified milk at primary care clinics created new opportunities for pregnancy and birth care for both mother and child. This strategy practically eradicated malnutrition, increased birth weight and contributed to the noteworthy reduction in infant mortality observed in Chile, 3.1/1000 live births for infants 28 days to 1 year of age. Women's educational level. This, says Koch, is the most important factor, and the one which increased the effect of all other factors. Educating women enhances a woman's ability to access existing health care resources and directly leads to a reduction in her risk of dying during pregnancy and childbirth. Data showed that for every additional year of maternal education in Chile there was a corresponding decrease in the MMR of 29.3/100,000 live births. "Although the primary care system currently provides universal access to a variety of contraceptives methods, actual use of hormonal contraceptives and intrauterine devices in Chile reaches approximately 36% of women of reproductive age. Therefore, as in developed nations, other factors not limited to the use of artificial contraceptives seem to be contributing to the reduction in TFR in Chile. One such factor could be women's increasing level of education." 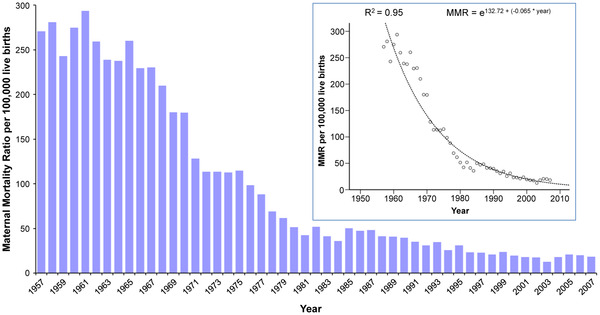 Before 1980 the causes of MMR in Chile were on the whole directly related to pregnancy and birth. From then on the underlying health problems of "aging pregnancy" began to take over in the mortality stakes: hypertension, diabetes and obesity among others. The problem now, there and here in the developed world, "is not a matter of how many children a mother has, but a matter of when." Koch's study shows that the custodians of reproductive health profoundly misunderstand the remedy for maternal mortality in developing countries. Will they do any better when they try to come to grips with the fertility paradox?